This is a favorite family recipe! For an 'on the go' breakfast, I serve these to my family in plastic, disposable cups with a straw. What a delicious way to get Vitamin A! This smoothie was garnished with pineapple mint and spearmint. Place all the ingredients in a blender. Blend until very smooth. Delicious! *if you don't have a frozen banana ready to to, use a fresh banana instead and add about 3/4 cup of ice cubes to the ingredient list. MMMM, yum! Thanks for sharing. Mr. T is crazy for pumpkin so will have to whip him up one of these! This sounds absolutely delicioso! Do you happen to have the nutrition breakdown for it? I'm interested in the calories, protein, carbs and dietary fiber. Tracking them these days! I don't, Adrienne, but if you have a nutritional count book, you can figure up the nutritional stats for the pumpkin, banana, and the kind of milk you use. The stevia will be zero of all those things --- and if you want to reduce calories further, you can use ice water instead of the milk/alternative. The recipe serves 2. Actually, I love the pumpkin so much that I double it. 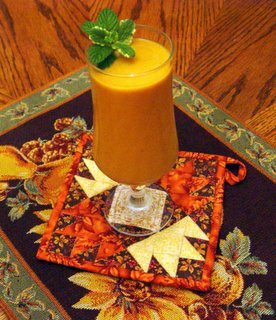 This sounds delicious, and my family loves pumpkin! I was hooked on Samba juice's pumpkin smash drink until I learned was almost 600 calorie! I'm going with your drink instead! Thanks for the info, LaDonna. I did think about calculating it myself. Will do and see what I come up with. Can't imagine how ymmy it will be! This sounds so good, and it's so easy to make! I think I'll give it a try this next week. Thanks for sharing! Wow! This is pumpkin? Awesome! This one looks so delicious. I would love to try this one.